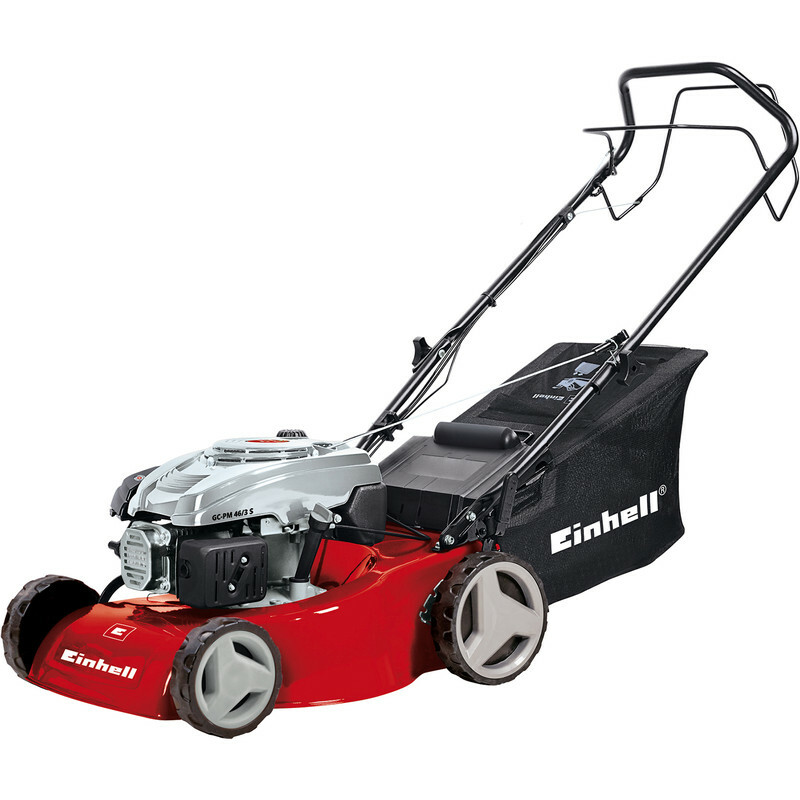 Einhell 135cc 46cm Self Propelled Petrol Lawnmower GC PM46/3S is rated 4.4 out of 5 by 8. Rated 4 out of 5 by feni from Good value for money Easy to assemble. Should include oil in package. Difficult to start at first but runs well, cuts well and drives well. Haven't used the grass box yet so can't comment. Seems pretty economical. Solidly built. Can't complain for the price. Rated 3 out of 5 by Head Gardener from A mixed Bag of good and poor features Good Features: Solid high quality build in general, starts easily when cold, simple to assemble with comprehensive instructions, bar a few admissions. i.e. although it does tell you how much oil to use it does not say what type. The front wheels are set narrower than the rear allow lawn edging to be easier in most arrangements. Poor Features: There is no throttle. Accordingly, for slow use, such as around flower beds and paths, it is too fast and for the main lawn it is too slow. Also plastic tyres have very little grip and leave skid marks in lawn when the drive is engaged and are hopeless going up even a slight incline. Even worse if the lawn is slightly damp which is not supposed to be a problem with rotary mowers. Grass collector box is too small and quite flimsy in construction (Very thin plastic mesh and Velcro). Extremely difficult to start when warm (not when hot or cold but say left for 20 mins or so). A throttle with manual choke would be very useful here. Note: Another local user of this exact mower has the very same problem. Overall: A well built machine spoilt by penny pinching features - no throttle, plastic tyres, small collector box. Rated 5 out of 5 by Edward John from Good solid mower Purchased this having just blown the engin on my existing Alko. Good price for engine and deck size. Easy assembly and runs well. Single height adjustment works well so very pleased with brand and mower. Rated 3 out of 5 by Pragmatist from Average Lawn mower works ok generally but consider the following: It’s heavy to lift and the sharp edges of the body mean it’s heavy to get a decent hold of. The grass box is too small - I was emptying it every 40 linear metres if cutting. There is no bottle if engine oil supplied, so buy one when you purchase and save a second trip. The manual is not clear on volume of oil required, basically, fill, check, fill, check and so on. The rear axle is wider than the front meaning you can’t get right up to the edge of the lawn to trim the border c. 100mm. Occasionally does not start when hot. The box is very large, if you buy it you may need to fold down your back seats in the car to get it home. It went into my large estate car ok, hatchbacks might manage but saloons can forget it. Take the free delivery option. Rated 5 out of 5 by Ninal57 from Cuts well Used for the first time it was a bugger to start which was probably my own fault as I pushed the fuel primer too many times expecting it to develop some back pressure. Once started it cut fairly long grass with no problem. The collection bag worked well and the mower was light and easy to use. Starting now just needs a determined pull but nothing overly strenuous. Having read other reviews I expect to be flying around but found it was more of a leisurely walk, I might tweet the carb to make it go a bit faster which could also help it start more easily. For the price it’s a good bit of kit. Rated 5 out of 5 by Dwac from Great bit of kut5 I bought this to do a large garden that was in need of a petrol lawnmower to do the job. A lovely mower,easy to use. Lovely machine great value for the price.